I tested a possible recipe for my upcoming PB&J party last night: PB&J bars. They start with a base of refrigerated peanut butter cookie dough. After cooling completely, the cookie base is covered with sugar-free strawberry preserves. The jam layer is then topped by a layer of fat-free cream cheese blended with sugar-free Torani French Vanilla syrup. The final touch is a drizzle of the sugar-free preserves on top. The bars weren’t quite what I wanted. 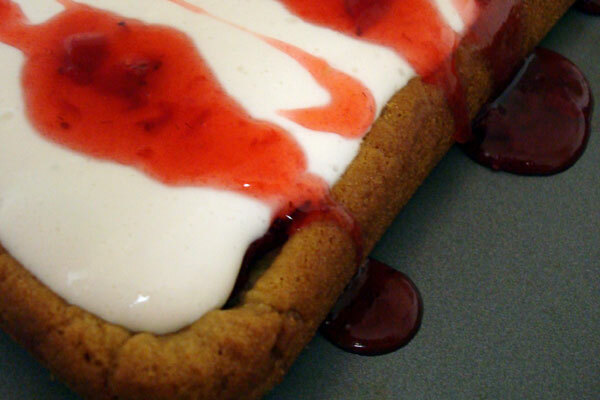 The cream cheese layer overwhelmed the flavors of the other elements, especially the strawberry preserves. Tasting the peanut butter and jam together is key to the recipe, so I am considering some other ideas. One is to omit the cream cheese layer entirely. Another is to mix the preserves into the cream cheese layer. 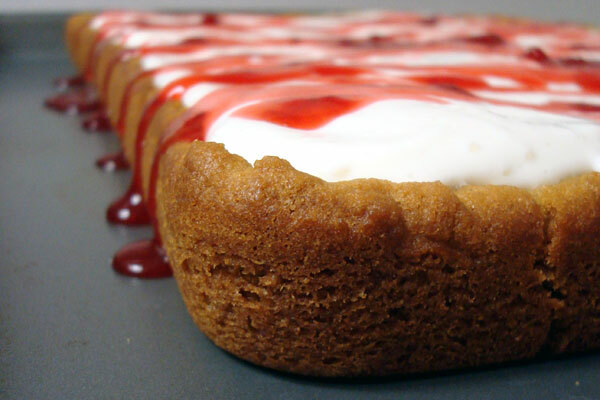 Yet another thought is to cut the cream cheese amount in half and mix sugar-free Torani Strawberry syrup into it. It’s fun to experiment a bit. And even though they weren’t what I wanted, these bars sure looked pretty! Entry filed under: food review, recipes.